Less Competition- Looking to buy or sell a home during the fall means that there will be less people looking for what you want. According to Forbes, most families are looking to purchase a home before school starts, and will be out of the picture for buying your desired home. 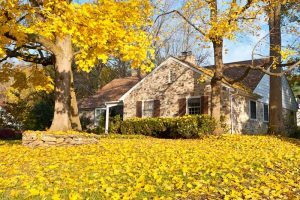 For sellers, those who are still looking for houses during the fall are invested and serious about what they are looking for, and you are more available for them. Tax Breaks- Buying a home and closing escrow before Dec. 31st can help your property tax and mortgage interest be deducted for your annual income that year. If a seller can increase their adjusted cost basis, they can decrease their capital gain, determining what or gain or loss. If you have less of a gain, you can better fall into the exclusion limit, and if it is more, you will pay less on taxes according to The Balance. For more on these tax breaks, check out this article. Great Timing for the Seasons- Getting into a new house toward the end of the year allows you to prepare to host the holidays, and may even help with moving companies’ availability. Better Prices- When selling, you are able to make your selling price more of what you think it should be worth. Because of the smaller amount of shoppers, you can price your home more realistically than other homes, based on your improvements and the value you give you home. As a buyer, your budget will be better suited with less shoppers to enter into bidding wars with. Safety comes with the Fall- According to Sarah Brown, from SafeWise.com, during July – August there is a peak amount of burglaries. Waiting until autumn may allow you a better idea of your neighborhoods safety, and allow you the time to prepare your house for the next peak season of robberies. Deals on Supplies- The ability to score a great deal on home improvement items increases during the holiday months. For a list of when to buy items for the best price, click here. Fall might be the best time for you. When the time is right for you to buy your home, don’t hesitate to contact us at LDSAgents.com, and we will help you find the best agents, so you can get into your dream home.